So in preparation for my instrument adventures next year, here's some info on the hurdy-gurdy that focuses on the wide range of sounds that it makes and the contexts in which these sounds had cultural capital. What is a hurdy-gurdy? That seems like a good place to start. The hurdy-gurdy is a musical instrument with regional variants appearing across eastern and western Europe. Here are a few monickers to give you a taste of its breadth: hurdy-gurdy (English), vielle à roue (French), Drehleier (German), tekerő" (Hungarian), ghironda (Italian), vièrlerète (Belgian), zanfoña (Spanish), sanfona (Portugese), brenka (Basque), viola de roda (Catalan), ninera (Slovakian), lira korbowa (Polish), колёсная лира (Russian). As implied by several of these names (#etymologygame) this instrument has something to do with a "turning wheel". In basic terms, the hurdy-gurdy is a pear- or guitar-shaped resonating box strung with tunable melody and drone strings and fixed with a hand-cranked, rosined wheel that acts like a never-ending, circular violin bow while the melody strings pass through a tangent box where pitches are raised or lowered by means of keys. The following section has descriptions of some of the instrument's different sounds and historical contexts. Be sure to click on the links to hear/see some sampled YouTube videos. It's easier to see it in action than read a description about it! Apocalypse jam session depicted in 12th century cathedral of Santiago de Compostela. Illustration by Jacques Callo from circa 1624. Demonstrating the lifestyle choices of the devoted hurdy-gurdy artist/mendicant. One of the hurdy-gurdy's most distinctive features since the Renaissance is the buzzing bridge. (It's first visual depiction seems to be from Heironymous Bosch's (ca. 1450-1516) Garden of Earthly Delights.) The way it works is that there is a drone string supported by a specially constructed bridge (called the "chien" or "dog" in French terminology) that is uneven, only connected to the instrument by a single foot. Changes in wheel velocity set the dog "barking" with a characteristic buzzing sound. (Sometimes I think it sounds like a scraping cabasa.) Two examples of this in action should clarify: 1) An Italian ghironda with slow motion and 2) demonstrations of how wrist action effects crank velocity and leads to various patterns. This adds a completely new dimension to the music because the rhythmic buzzing of the right hand operates independently of the left hand's manipulation of the key box and they can interact in so many different ways. To give some context of this happening in a piece, check out 1) Eric Raillard playing a Morvan traditional tune with various chien patterns, 2) Nigel Eaton playing a dance piece that adds the chien around 1:09 to great effect, and 3) TOMO playing a French folk melody with chien and what I assume is a kick drum. 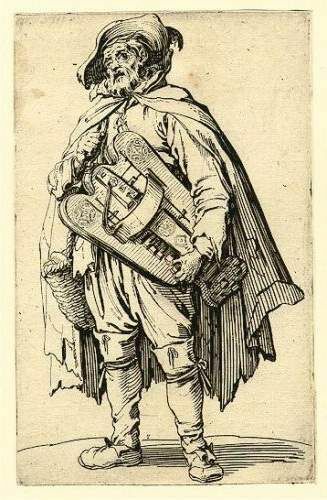 By the 18th century the hurdy-gurdy had a well established reputation as a low class instrument fit for peasants and beggars. But around this same time the French aristocracy developed an intense enthusiasm for pastoral diversions (just without the dirt and poverty). 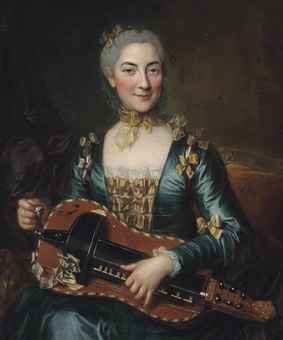 Operas and ballets depicted idealized shepherds and shepherdesses, rococo art emphasized stylized tendrils as design elements, and folk instruments such as the hurdy-gurdy (vielle à roue) and bagpipe (cabrette) found themselves in vogue with the highest echelons of society. (Here is an example of Sean Folsom playing a folksong that includes the vielle and cabrette together. Now that I write that sentence, I'm not sure how that's humanly possible...) Aristocrats actually took the time to became skilled at playing this instrument, multiple treatises appeared giving detailed instruction, and court-sponsored composers wrote substantial and serious pieces. Check out Robert A. Greene's The Hurdy-Gurdy in Eighteenth-Century France (1995) for all the info on this period you can handle. Listening to this music I notice the importance of dance as well as lavish ornamentation and emotional nuance. Clips: 1) some pièces de charactéres by Jean-Baptiste Dupuits (1715-1758), 2) a movement from a trio sonata for two vielles and basso continuo by Jacques-Christoph Naudot (1690-1752), and 3) Antonio Vivaldi's (1678-1741) beloved Seasons arranged for vielle à roue by Nicolas Chédeville (1705-1782) because why not? The nineteenth century developed a Romantic view of folk culture with conflicted, nostalgic, and nationalistic overtones. 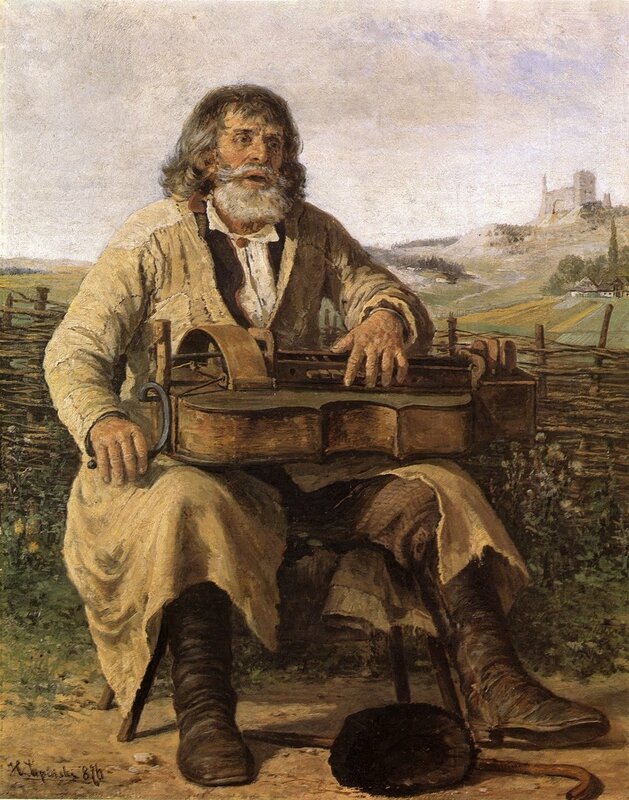 While in many ways this was the age of the piano (where Industrial Revolution met the Age of Sentimentality), the hurdy-gurdy continued to have a symbolic and emotional association and operated as a musical trope. For instance, Franz Schubert (1797-1828) set poems by Wilheml Müller (1794-1827) for a song cycle for piano and solo voice called Winterreise or Winter's Journey. It's a painfully tragic song cycle for solo voice and piano which ends with Der Leiermann or The Hurdy-Gurdy Player. Over there behind the village / Stands a hurdy-gurdy man / And with stiff fingers / Turns over what he can. Barefoot on the ice / He rocks back and forth / And his little plate / Always remains empty. No one wants to hear him, / No one wants to look at him, / And the dogs growl / Around the old man. And he lets it happen / Everything turns as it will / And his hurdy-gurdy / Never stands still. Wonder of the ancients / Shall I go with you? / Would you play my songs / On your hurdy-gurdy as well? Schubert sets this icy text very starkly by evoking the hurdy-gurdy's drone and repeating a spooky melodic fragment. For a cycle that has traversed so many emotions, this concluding piece falls deep into emotional and musical numbness. Here's a clip of Thomas Quasthoff and Daniel Barenboim performing it. Interestingly, Matthias Loibner arranged this composition for solo singer with hurdy-gurdy accompaniment which makes for a very different sound world. It makes me aware of the emotional flatlining that awaits the narrator at the end. Here's Der Leiermann accompanied by a Leiermann! Much has happened since the 19th century, but it's interesting to note an enduring strain of nostalgia for folk culture that continues to utilize the hurdy-gurdy. Recently this has surfaced in various sub-genres of heavy metal. Sometimes known as folk metal or medieval metal or German folk-rock metal, this 1990s European fusion melds together the guitar, drums, vocals, and head-banging of heavy metal with traditional instruments like tin whistles, violins, harps, bagpipes, and hurdy-gurdies. Here are some examples: 1) Swiss band (pronounce it el-VAY-tee) Eluveitie's song Inis Mona, 2) German band Subway to Sally's song Besser Du Rennst, 3) Belgian band Ithilien's song Blindfolded, and 4) German band Saltatio Mortis's song Hochzeitstanz. If you think about all the abrasive and edgy sounds the hurdy-gurdy is capable of, it makes sense that it would find a place in this type of music. I personally find it difficult to pick out the sound of the hurdy-gurdy through the thick textures. 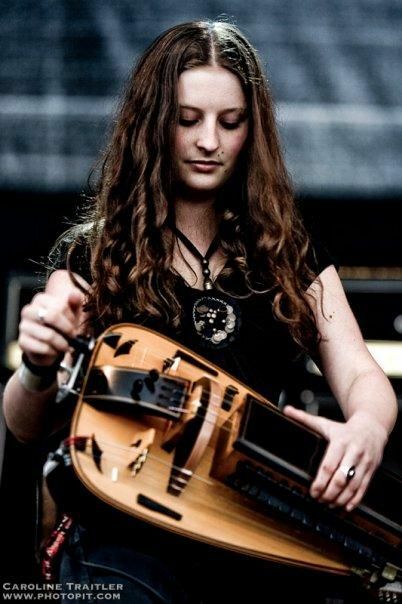 But there's more to heavy metal than just the sound and I would venture a guess that the hurdy-gurdy lends a lot of visual interest. It comes across as a medieval contraption and, because it is less well known than the bagpipe, its marginality has an air of mystique. The hurdy-gurdy also plays a part in more intimate settings. Here the theatricality is toned down, but the strange sound and sight of the instrument keep a toe in the world of heavy metal. Two examples are 1) Anna Murphy playing A Rose for Epona and 2) Patty Gurdy (that's right) of the German pirate folk metal band Storm Seeker (that's right) playing a cover of Sweet Dreams. Matthias Loibner making sounds with plaid pants and astounding virtuosity. As the example of the buzzing bridge shows, the hurdy-gurdy, already a pretty complicated machine, can become even more complicated. Just take for example the Full Montey hurdy-gurdy by Altarwind Music that has all the add-ons: dozens of strings, buzzing bridges, capos, on/off switches, sympathetic strings, amp hookups, fretboards, cup holders, bells/whistles, spinning hubcaps, etc. (Disclaimer: I cannot guarantee the accuracy of this description. See Altarwind website for details.) These possibilities have caught the imagination of various composers/performers seeking new and experimental sounds. Matthias Loibner (b. 1969) sums it up well when he states in this recording at an aCentral Folque concert, "I will start somewhere and I will end somewhere, but I am not sure about it." 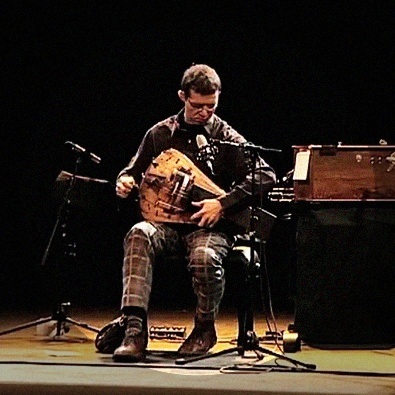 Ben Grossman considers the hurdy-gurdy an "acoustic synthesizer" that has much to offer for "early, traditional, experimental, and ambient" musics. Here he is with an improvisation and explanation for TEDxWaterloo. Stevie Wishart (b. 1969) sees the hurdy-gurdy and other marginal instruments from the forgotten past as having greater potential for innovation because of the lack of present-day conventions, which opens the door to improvisation. She teamed up with Fred Frith (b. 1949) and Carla Kihlstedt (b. 1971) to record a series of improvisations: here's one called Aller Retour with the hurdy-gurdy entering around 1:27. I'll see you in January for the unboxing of my hurdy-gurdy!